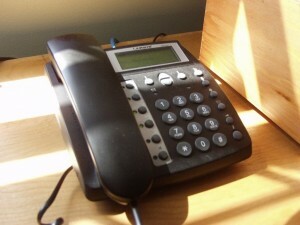 A common source of echo in VoIP phone systems is the telephone handsets. Of course, non-VoIP phone systems have this source of echo too, but it often is not so evident because without the buffering the echo delay is not as long. Old Bell 500 series telephones have a wad of cotton wool in the handset to prevent sound from traveling from the receiver, through the hollow handset body, to the transmitter. But, many modern telephone handsets lack this important component. Here I show how I added cotton wool to the handset of a Linksys SPA-841 in order to reduce echo. 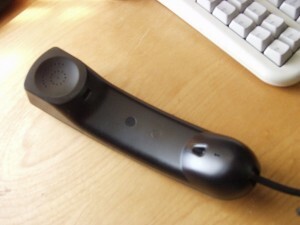 Here is a typical SIP telephone, a Linksys SPA-841. It is not a bad phone, but there is a noticable echo. In order to add cotton wool, we must first open the handset. Notice the small foam-rubber plug in the centre. This plug conceals a screw. 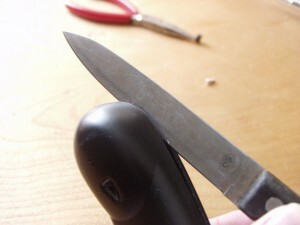 The plug should be gently removed using tweezers or needle-nose pliers. Once it is out, the screw can be removed. Even with the plug out, the two halves of the handset are held together with clips. Take a dull knife and gently pry them apart. Now that the handset is open, we see that there is no cotton whool. 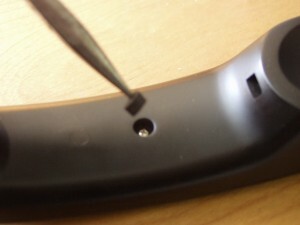 The piece of steel in the center is to give the handset more weight. Otherwise it would tend to slip out of the hand easily and would give the impression of poor quality. 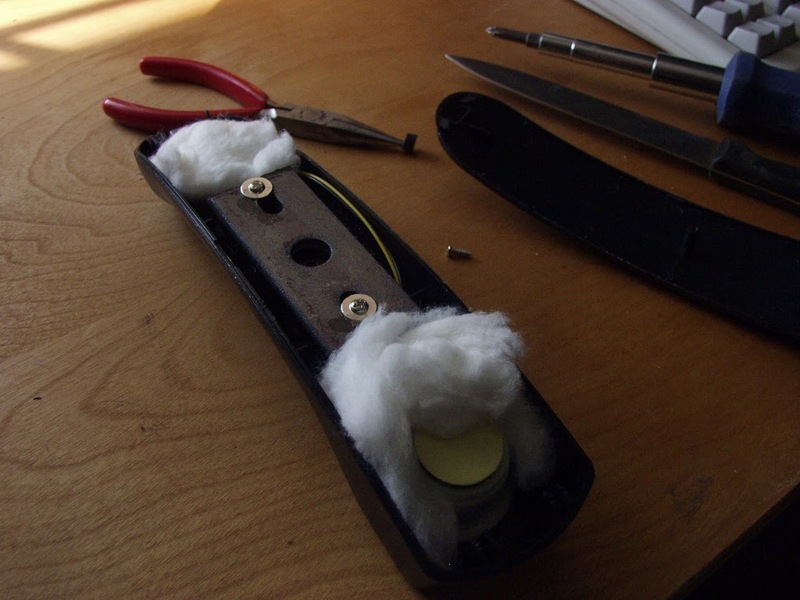 Here we have packed cotton whool around the transmitter and receiver. All that is left to do is reasemble the handset. 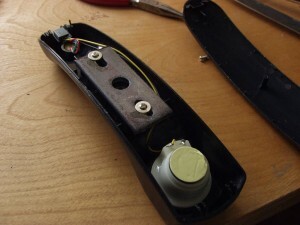 If the clips broke when you pried it apart, a small drop of glue may be in order. Since I modified my telephone in this way, it seems to have noticably less echo. I have tried to modify other telephones in this way, but so far without success. I can find now screw and attempts to pry the two halves apart are unavailing. If you have suggestions about how common handsets can be opened, please put them in the comments section.